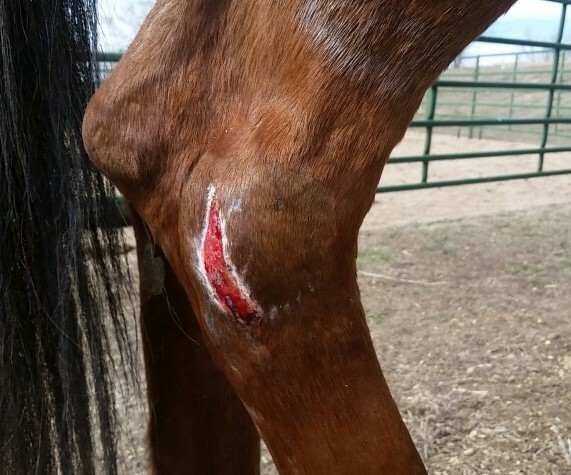 “My horse has a cut on his leg, what should I do?” This is one of the most common questions we hear. The critical things to know are depth, discharge, and whether important structures are involved. Wound depth can not always be determined by looking. In a typical wound, you can see hair missing, a raw spot, and maybe edges and deeper structures. If all you see is missing hair, the wound is not serious, and all that is required is to keep it clean with water. If you are able to identify complete edges on both sides of a wound, the wound is termed full thickness. Full thickness means that the skin has been cut clear through, and that structures inside are exposed to the outside. These wounds require inspection by your veterinarian, because they often are like an iceberg, bigger on the inside than on the outside. There may be tendons, ligaments, muscles or joints underneath that are damaged, and often there is debris like manure and hair packed inside. These wounds are likely to get infected and need medical management in order to get good healing. The last bit of information to process is whether or not important internal structures are involved. Wounds that involve joints, tendon sheaths, tendons, ligaments, or bone are particularly serious because infection or injury to these structures can become life threatening. These wounds can often be managed successfully if diagnosed early. Once infection has set in, it is much more difficult to achieve a good outcome. An important part of this assessment is determining how much pain the horse is in. If he is limping or unwilling to bear weight, is off feed or lethargic, it’s time to call your veterinarian. “Does my horse’s wound need stitches?” Wound suturing is recommended for larger wounds, wounds with a lot of injury underneath the skin, if tendons, muscles, or joints are involved, and if a good cosmetic result is desired. Usually, sutured wounds heal faster than those left to heal by themselves, with less scarring. Wounds over joints can be successfully sutured, they just require specialized bandaging to limit movement while the cut heals. “My horse’s wound has pus coming out of it. What should I do?” These wounds are infected, usually with bacteria and debris from the skin, as well as the barnyard. Infected wounds are swollen, red, have discharge, may or may not smell bad, and are painful. These wounds are treated in two ways. First, it is essential to decontaminate the wound. This is done by applying large quantities of hypertonic saline solution to the wound to dilute the discharge. In a pinch, you can use a garden hose to decontaminate a wound. Do not apply Furacin, disinfectants, antibiotics, soap, bleach, Vetricyn, or other substances unless directed to do so by your veterinarian. Sampling of the wound for bacterial culture and determination of antibiotic sensitivity may be very important in order to get the infection resolved. Bandaging of draining wounds on legs is helpful to remove discharge and protect the raw surfaces from recontamination by the environment. The frequency of bandage change is determined by how quickly drainage soils the bandage material. It is very possible to suture wounds that have become infected once the infection is under control, using a technique called delayed primary closure. Pain management for horses with wounds is very important. Numerous studies have shown that adequate pain management speeds and improves the quality of wound healing. It is a matter of humane treatment of animals as well. Minor wound pain is often well managed with anti-inflammatories like phenylbutazone, Previcox, or others. More substantial wounds may require opiates, local anesthetics, epidural, or other modalities to adequately control the pain. This cut was treated with hypertonic saline solution only after a partial failure of surgical repair. Photo is one month after the initial injury. Notice the lack of proud flesh and infection. You can also see the new skin growing in from the edges of the wound.